Apple on Monday gave users their first glimpse at iOS 5, the next iteration of the company’s mobile operating system for iPhones, iPads, and iPod touch models. During the keynote address at the Worldwide Developers Conference, Apple senior vice president Scott Forstall covered 10 of the over 200 new consumer-level features planned for iOS 5. With iOS 5, Apple introduces a couple brand new apps, revamps many others, rethinks notifications, and finally severs the cord between iOS and the Mac. Developers get a copy of iOS 5 on Monday. The finished version will be available to consumers in the fall. For many users, perhaps no new iOS 5 feature will be more welcome than its overhauled notifications system. The days of the modal, one-at-a-time pop-up alert are ending, and Forstall’s declaration that iOS 5 includes an upgrade brought an uproarious cheer from the developers in attendance. For starters, when you're actively using your iOS device, new notifications no longer take over your screen and require you to deal with them. Instead, they appear in a subtle, smaller, animated bar that slides down from the top of the screen. If you tap the notification, you're taken directly to the app that sent it; otherwise you can ignore the notification—it will go away on its own. But instead of disappearing into the ether, notifications are now archived: iOS 5 also introduces something Apple calls Notification Center, a single place that combines all of your notifications. You can access Notification Center at any time with a single downward swipe from top of your device's screen—a gesture which, it must be said, achieves the same effect already on Android phones. Notification Center then slides down to display a list—sorted by app—of push notifications you've received, including missed calls, voicemails, text messages, and app-specific notifications. Apple has also added stock and weather updates. Within Notification Center, you can tap a notification to switch directly to the app that sent that notification, or you can easily delete notifications you no longer need. Dismiss Notification Center and you get right back to your app. The iOS lock screen now handles notifications better, too. You can swipe across a notification on the lock screen to go directly to the appropriate app. For example, Forstall swiped across a text message notification on his lock screen, which took him directly to that text in the Messages app. Forstall declared that folks want to buy iPhones and iPads without needing computers to tether them to. Starting with iOS 5, new iPhones will lose the traditional "Connect to iTunes" screen and instead display a Welcome screen—a quick swipe and you can activate your device on the device itself. Software updates—as in, new iOS updates—are now sent over the air, too, so you no longer have to connect a cable to your computer to get the latest incarnation of the operating system through iTunes. You also no longer need to plug your iOS device into your computer to sync media, and thanks to delta updates (which include only code that's been changed), iOS-app updates will be much smaller. Forstall said that, as part of cutting the PC cord, Apple looked to eliminate those situations where folks go back to their computers instead of using their iOS devices. Various tasks—like adding and deleting calendars, creating and deleting mailboxes in Mail, and basic photo editing—will in iOS 5 be possible right on your iPhone, iPad, or iPod touch to help eliminate the PC as an iOS requirement. As rumored in the run-up to the WWDC keynote, iOS 5 includes a new messaging feature called iMessages, built into the Messages app, that lets you sends texts, photos, videos, and contacts—and supports group messaging—with other iOS devices. Different from traditional text messaging, iMessage messages can be sent only between iOS devices, and include new features such as delivery receipts, read receipts, and iChat-like indications of when your contacts are typing back to you. 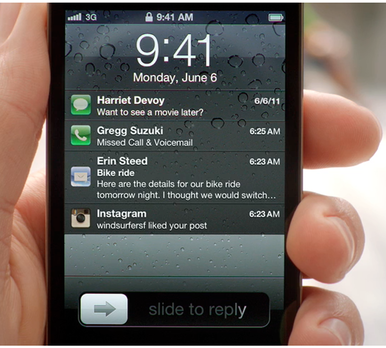 Messages are delivered to all your iOS devices, work over both 3G and Wi-Fi, and are encrypted, to boot. 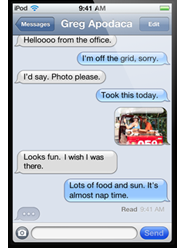 It’s a new take on instant messaging, even though it doesn't replace SMS. Forstall said that Safari on iOS accounts for almost two-thirds of mobile Web browsing, and its engine, which is the base of Android Web browsers, accounts for nearly 90 percent of all mobile browsing. 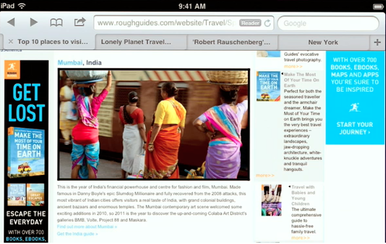 Among Safari’s new features in iOS 5 is a feature called Reader. Like the similar functionality in the desktop version of Safari, Reader lets you get (and share) just the content of an article, removing navigation, ads, and other extras; it also reformats that content for easier reading. Also new is Reading List, which is a simple and convenient way to save a story for later reading. Items in your Reading List are synced to Safari on all your iOS 5 devices, as well as to all your Macs running Lion. Tabbed browsing makes its first appearance in Safari in iOS 5, too. Tabs look and function much as you’d expect—that is, just like they do in Safari on the Mac—and, based on the demo Apple showed, are much faster to switch between than the "pages" feature of iOS 4 Safari. However, this feature is limited in iOS 5 to the iPad, likely due to space constraints on the smaller screens of the iPhone and iPod touch. Forstall said that “most of the major publishers of magazines, and many newspapers” have signed up for App Store subscriptions already. Newsstand is a devoted app for accessing and downloading those periodicals. 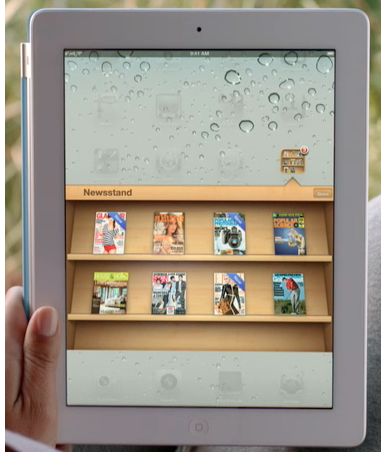 The interface looks a lot like iBooks, only it focuses on magazines and newspapers instead. The app also supports background downloads—for example, new issues that arrive overnight will download automatically and be waiting for you in the morning. In practice, Newstand behaves a lot like an iOS folder. As you can see in the screenshot below, when you tap the Newsstand icon, it doesn't launch a true app; it simply reveals collected icons for your subscriptions. According to Forstall, Twitter user send more than 1 billion messages per week, and Apple wants to make it even easier for customers to use the service. New in iOS 5 is single-sign-on support for Twitter—once you configure your login credentials in the Settings app, third-party Twitter clients will be able to access your login details without requiring separate sign-in within each app. In addition, several of Apple’s own apps, including Photos, Safari, YouTube, and Maps, will support direct Twitter integration, so that you can quickly post data from those apps to your Twitter account. You'll also be able to use Twitter to automatically update the images and Twitter usernames for your contacts. Though the App Store is rife with reminder apps—or, perhaps, because it’s rife with such apps—Apple is introducing a task/list app, Reminders, with iOS 5. 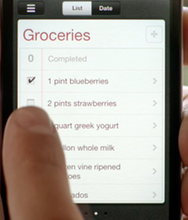 The app supports multiple lists of tasks, with alerts that can be either date- or location-based. Those locations are particularly powerful—your device can remind you about a task when you reach a specific location, or depart from one. Reminders are also searchable, and will sync with iCal on the Mac and Outlook on Windows. 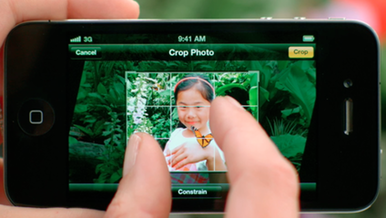 The Camera app will also sport optional grid lines to better compose your photographs, pinch-to-zoom (for digital zooming), and auto-focus and auto-exposure locking. Also built into the app will be new editing features—specifically, crop, rotate, red-eye reduction, and iPhoto’s one-click enhance. Mail, Forstall said, is one of the most-used apps across iOS devices. In iOS 5, Mail (finally) gets rich text formatting (think bold, italics, underline); indentation options; the capability to drag addresses between addres fields; support for flagging; and more. The biggest of that “more” is full-message searching, which Apple says will include messages not downloaded onto the device but present on the server. And on the iPad, you can now swipe to bring up the inbox when in portrait mode. Exchange customers get some love, too, with iOS 5’s new support for S/MIME—a lock icon will appear in the To field to indicate when you’re sending encrypted messages. 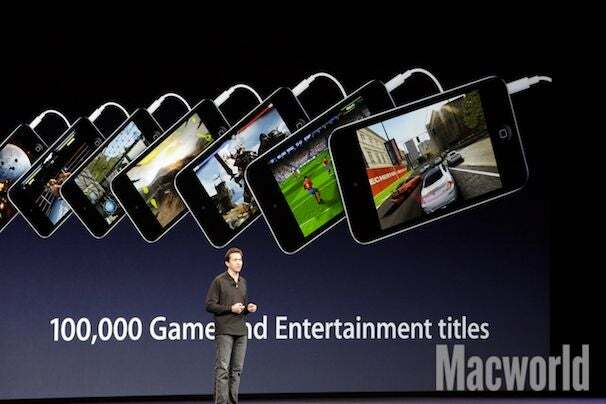 iOS is the most popular gaming platform on the planet, Forstall said, and the company's Game Center now has 50 million users after only nine months (Microsoft's Xbox Live is eight years old, and has just 30 million users.) Thankfully, the Game Center app is improving, offering OS-level support for turn-based games; the capability to purchase and download games from within Game Center; and game recommendations. Game Center is getting more social, as well, allowing you to choose your member photo, compare yourself against friends using achievement points, see friends of friends, and get friend recommendations. During his Mail demo, Forstall also touched on a couple systemwide changes that many will find welcome. One is that the built-in dictionary from iBooks—which lets you tap and hold to see a word’s definition—will be available system-wide. The other is a new-and-improved iPad keyboard designed specifically for thumb typers. Within any app that uses the iPad's onscreen keyboard, you'll be able to split the keyboard into left and right halves that sit higher on the screen to make it easier to type with your thumbs while you're holding the iPad. According to Forstall, those are just a sampling of new features in iOS 5. He showed a slide packed with several others, including AirPlay mirroring to your Apple TV, Wi-Fi iTunes sync, new multitouch gestures to flick between apps, a new iPad Music app, personal dictionary support, hourly weather forecasts, typing shortcuts, alternate routes in maps, voiceover options, wireless sync for Exchange tasks, FaceTime mid-call invitation alerts, improved FaceTime video quality, mass configuration, real-time stock quotes, custom vibration patterns, accessible input for mobility, improved offline support in Mail, voiceover item chooser, an option to speak text, and finally, the long-awaited capability to set tones for voicemail, mail, and calendar alerts. Forstall said that iOS 5 will ship to customers this fall, and it will support the iPhone 3GS and 4, the third- and fourth-generation iPod touch, and all iPads. Updated at 11:40 a.m. PT with more information throughout the story; at 3:53 p.m. PT with additional screenshots and further details throughout; and at 2:30 p.m. with many more details throughout.